Improve your technique - see our illustrated guide. Thank you for your interest in ballistic root vegetables. This is the official site of the Mangold Hurling Association, whose goals are to make the traditional Somerset sport of Mangold Hurling known to a wider public and to encourage others to join this happy band of Hurlers. What healthier way could there be to take exercise and make new friends at the same time? Put simply, Mangold Hurling is the sport of throwing – or more accurately pitching – the mangold-wurzel. It requires skill, strength and cunning. 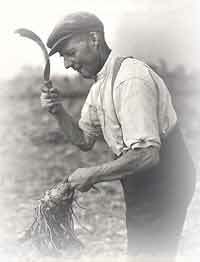 Mangold Hurling is usually performed during October each year. 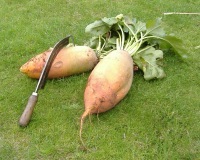 The mangold-wurzel (or mangel-wurzel) is a vegetable of the beet family, grown mainly as a fodder crop. A local Club chairman preparing the Norman with the special cutting tool. See Rules for further information. We hope you enjoy finding out about Mangold Hurling and that you will be inspired to have a go yourself. But remember, the mangold can be a lethal weapon in inexperienced hands. We urge you to seek expert tuition before "going solo". The Mangold Hurling Association cannot be held responsible for any vegetable-related injuries incurred in pursuit of this sport. Text and original images copyright © The Mangold Hurling Association 2003 - 2009. Sources of third party images have been acknowledged where known.